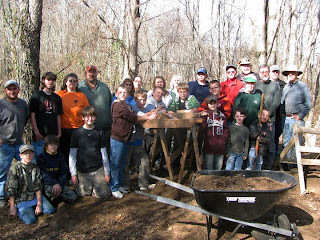 ﻿ We have been digging for clues and even had a Bland County Board of Supervisor's member help us out. 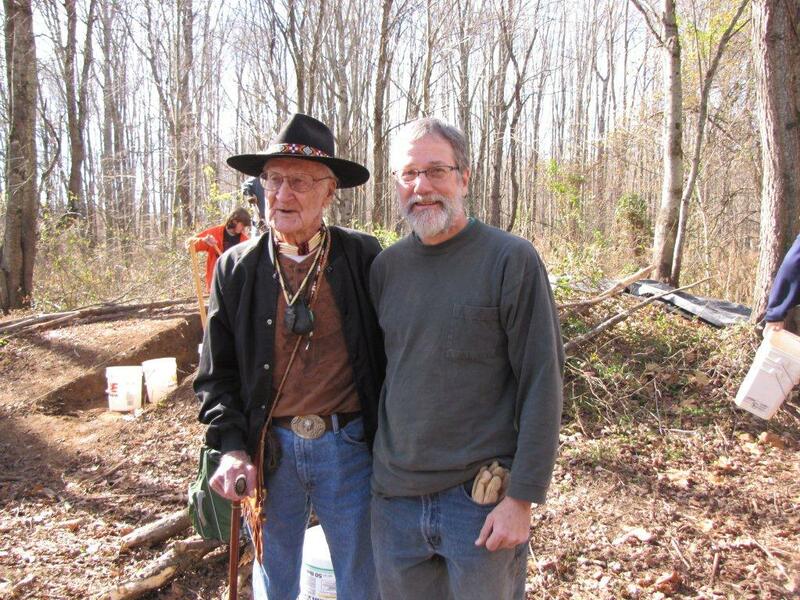 Members of the Archeological Society of Virginia’s chapters in the southwestern portion of the state renewed investigations at the Brown Johnston Site at Bastian Nov. 6 and 13. The site, occupied around 1500, is popularly known by its re-creation at the Wolf Creek Indian Village and Museum. Their project examined topsoil, or back dirt, removed by heavy machinery from the late Woodland period village site and deposited in a long, low pile nearby in the full site excavation more than 41 year ago. ﻿ The back dirt was never formally examined for artifacts it may have contained when late archaeologist Col. Howard MacCord excavated the Brown Johnston Site in 1970. Instead, MacCord focused on locating and excavating important archaeological features beneath the topsoil. Such features reveal the locations of dwellings, burials, storage pits, hearths and the palisade that surrounded the village. Construction of Interstate 77 in 1970 required the relocation of Wolf Creek to allow construction of the Bastian interchange. Before the creek’s realignment destroyed the prehistoric village site, construction paused as MacCord worked to retrieve as much data from the site as possible to construct a picture of life in the village. The relatively small number of artifacts recovered from the site and other indicators led MacCord to conclude the site was occupied for only four to five years. The research goal of this project was to sample the back dirt to examine it for the presence of artifacts like stone tools, projectile points/knives, and pot shards whose number in the topsoil would either support or challenge MacCord’s interpretation. 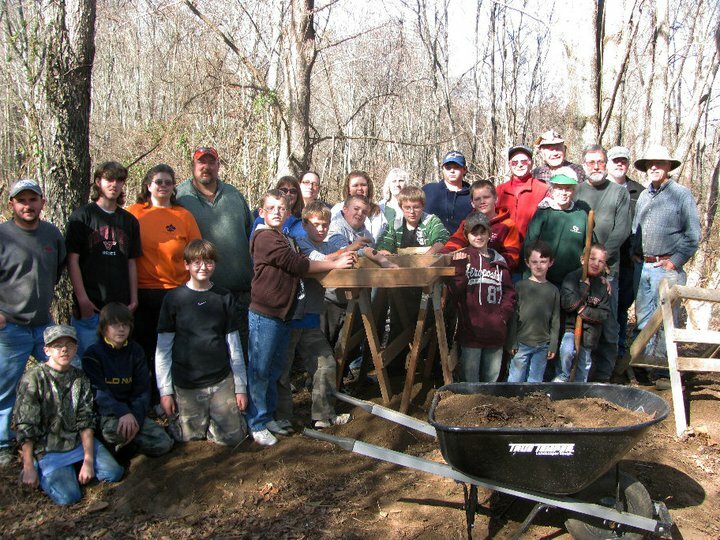 With the help of Boy Scouts and Bland County high school history students, and under the professional supervision of Tom Klatka, archaeologist with the Virginia Department of Historic Resources, the ASV members used quarter-inch mesh screen boxes to sift the back dirt. "After shoveling and sifting dirt all day on the first Saturday, we actually had several boys show up to do it all over again on the second day! 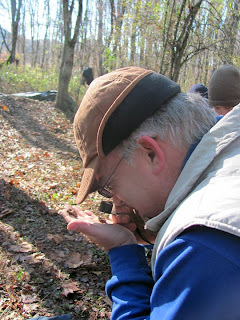 The boys were fascinated by the sifting process, the layers of earth, and the rocks they found." Scoutmaster Randy Kiser Troop 12 Bland County. The Group also showed their appreciation for Ms. Sandra Bowling, a beloved history teacher in Bland County in a rehabilitation hospital in Atlanta. 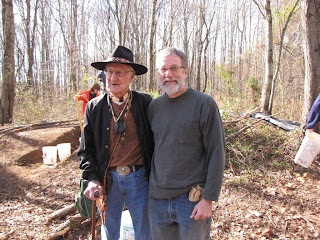 ﻿ Chief Peery "Grey Wolf" Wilson also visited the site and spoke with Tom Klatke of the Virginia Department of Historic Resources on the importance of the Wolf Creek site to the history of his people. 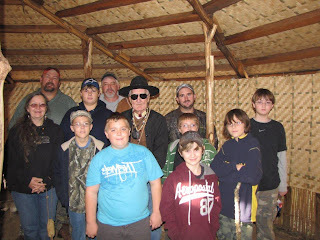 He spoke to the Boy Scout Troop members and had his picture taken in the new meeting lodge before the day's work November 13th. Sampling from two excavation units in the back dirt pile recovered one projectile point, two small pot shards, and a small number of chert and chalcedony flakes left from the manufacture of stone implements. While the sampled soil is a small percentage of the soil removed from the site, the low number of artifacts found in about 10 hours of screening supports MacCord’s interpretation, said Dan Kegley, ASV president-elect and president of the Abingdon-based Wolf Hills Chapter of the ASV. Their work may add to MacCord’s interpretation. Kegley said geologist Dr. Charles Bartlett, a founding member of the Wolf Hills Chapter who worked at the site Nov. 13, noted the site is underlain by Devonian shale that weathers into poor quality soil lacking nutrients to support sustained agriculture. By the late Woodland period, prehistoric people like those on the Wolf Creek relied on crops to supplement hunting and crops failure after two or three years might explain the short occupation of the site. Museum Director Denise Smith said an interpretive garden grown today in the village struggles in the poor soil as a demonstration of prehistoric agriculture. 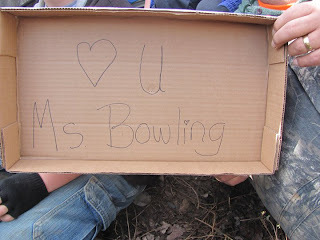 Perhaps its portrayal is in fact accurate for the site. Smith told Kegley and his chapter members about the unscreened topsoil in April that was brought to her attention a year ago by an excavation participant, and Kegley began the preliminary work of securing professional oversight and the endorsement of the ASV board. After photographing the artifacts and writing a paper on the project for the ASV’s Quarterly Bulletin, Kegley will return them to the museum for curation. Smith plans to open the topsoil sampling work to visitors to the village who would work under supervision.